Dr M is teaching the top 20 UK plant families and, as regular followers of drmgoeswild.com will know, he has already posted in some detail on a number of these families and the series is on-going. Here Dr M provides starts a short series of cameos on a selection of these families with top tips for family recognition. Fabaceae: the Pea or Legume family. The most striking feature for UK Fabaceae is the special pea flower (solitary or grouped into heads or racemes) which has 5 petals arranged in characteristic zygomorphic pea flowers (irregular flowers with only 1 plane of symmetry = bilateral). Unless very tiny, you can usually dissect one flower to show how it is made up of 1 upper standard petal at the back, two free lateral petals – the wings and 2 fused lower petals at the front – the keels. 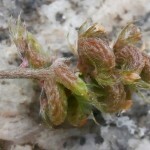 The sepals are usually fused into a calyx tube with 5 teeth. The leaves are usually compound (though reduced in some of the woody species e.g. 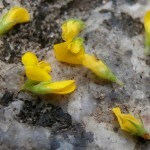 Cytisus (Broom) and Ulex (Gorse)), and may be trifoliate – e.g. 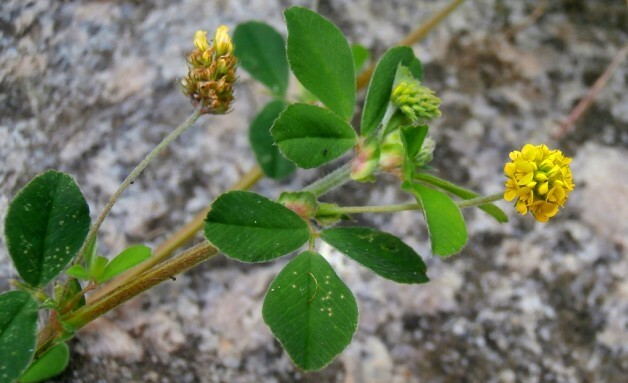 Trifolium (the Clovers) and Medicago (the Medicks), or palmate – e.g. Lupinus (the Lupins) – or pinnate – e.g. Vicia (the Vetches). 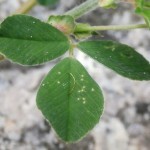 A key feature of the leaves are the stipules – a pair of appendages at the base of a leaf or its petiole and in Fabaceae usually leaf like (foliaceous). A further key feature is the fruit which is a pod (technically a legume – a dry, many-seeded fruit formed from 1 carpel and dehiscent (splitting) along 2 sides at maturity releasing the seeds), the pod may be elongated (e.g. Vicia (the Vetches)) or shorter e.g. Trifolium (the Clovers)) or spiral (e.g. 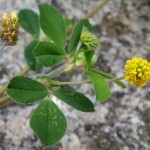 Medicago (the Medicks)). If there are flowers or fruits this family should be unmistakable in the UK, without flowers or fruits check the leaves and stipules. The gallery shows Meducago lupulina (Black Medick) a common plant of grassland and disturbed waste places. Check the images to make sure you can recognise the following: the characteristic zygomorphic pea flower, the calyx tube with 5 teeth, the trifoliate leaves each with a pair of stipules. In addition the spiral pod and the small notch in the leaflets are diagnostic for Medicago (the Medicks) but you won’t find these in other genera of Fabaceae. Click on the image once and then a second time to see all the important details! Click here to see Dr M’s top 20 family post on Fabaceae. Botanical note: UK Fabaceae (sub-family Faboideae) mostly have this typical pea flower structure, but globally there are sub-families with quite different flower types, and so, if you go travelling far overseas or visit a botanical garden, expect to find different flower forms in other groups of Fabaceae, e.g. Acacia with beautiful pom-pom-like flowers .